Topaz Earrings – These are London blue Topaz earrings. The cabochon gemstones set on sterling silver discs. 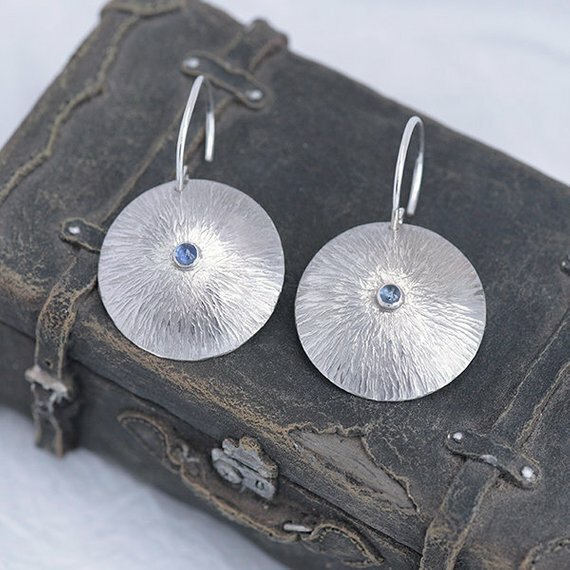 The dome shape discs have a hammered finish and the stones are set in sterling silver bezels. The round ear wires are sterling silver also. The perimeter of the discs have a subtle beveled edge as a comfortable feature and catches an extra glint of light around the rim. * sterling silver disc diameter: 22mm, 3/4 inch approx.